Wow, I totally forgot I've got a blog. Anyway, I just upgraded from my beloved iPhone 6 Plus, my first ever iPhone, to a 7 Plus (which I'm loving so far). One of the things that excited most about moving to my 6 Plus and, now to my 7 Plus, was case shopping. My previous phones never had the kind of case selection iPhones enjoy and, frankly, no phone does. I generally like my cases to be very protective and professional. Well, my last two favorite cases taught me that I can add some personality to my phone case without sacrificing the former two. Carved, a small case maker based out of Indiana, specializes in making cell phone cases out of wood. The cases come in a variety of protection levels, from simple skins, to thin cases, to thicker ones. Each case type has a plethora of wood panels that come on the back of the case. Two years ago, I purchased Carved's Walnut Burl Traveler case for my iPhone 6 Plus. The purchasing process was incredibly easy and within a short while, I had my beautiful case. The Traveler series is amongst Carved's most protective case type, with a wood panel on the back of a polycarbonate case and a rubber wrapping along the sides. There are cut-outs for the mute switch, headphone jack, speaker, and Lightning port. The final product protects the phone from all angles. The phone's front is slightly raised so that a face-down tumble won't shatter the screen. The inside of the case is signed by all those at Carved who contributed to the making of my case, making for a really nice, personalized touch. However the real star of the case is the walnut burl panel. I've never received as many compliments on a phone case as I did with my Carved case. Pictures don't really do it justice. The case looks simply stunning and very professional. After two years of use, the wood has warped (as expected), however, the case itself is still as it was when I got it. It has protected my perfect-condition iPhone from many falls and has left my iPhone still looking new. I was so happy with my Walnut Burl case that I couldn't wait to purchase a second case from Carved for my iPhone 7 Plus. This time, I went for Carved's Satellite Series. The Satellite Series takes cues from nature, a mixture wood with colors and resin that delivers a beautiful finished product. The dark green and wood Traveler case is breathtaking, looking far better than any picture I had seen of it. The nature of wood cases lends itself to unique cuts, as no two pieces of wood will ever be alike. Carved has also updated it's rubber casing, making for a slightly grippier feel and more pronounced inlay. This makes the phone very comfortable in your hand. On the back, you can feel the tiny nooks and imperfections that make a wood case authentic. While I've only had my phone and case for less than a week, I know from previous experiences that my new case will be equally or more durable than my first Carved case. However, every single person who's seen my Satellite series case honestly could not believe how beautiful a case it is. Carved will forever be at the top of my iPhone case list and I cannot recommend them enough! I opened Timehop this morning and my face was probably in shock as I looked upon the tweets of excitement, frustration, desperation, and excitement one last time. 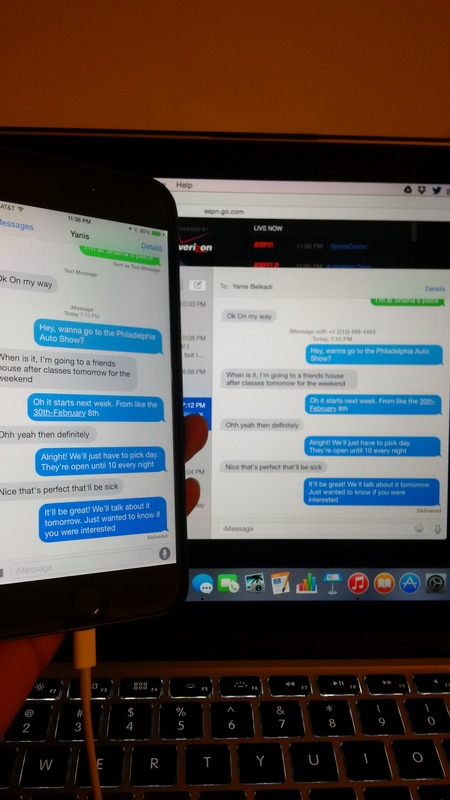 You see, it was on an early, chilly but sunny Tuesday morning that I decided to skip class, take a chance on online in-stock numbers, and wait in line in front of Philadelphia's Walnut Street Apple Store for an iPhone 6 Plus. It was an unforgettable day for me for many reasons, but the foremost reason being that it changed the way I looked at consumer technology and to what standards I hold new technology. It was my first Apple product and I had no idea what I was getting into. After swearing I'd never own an Apple product ever, I finally did it that day. I think it's great to step back and reflect on how tiny events change your personality and outlook on certain things, even minuscule and insignificant things like smartphones. That's what this is. First things first, though, how's it held up? Pretty well, actually. The front of my 6 Plus is covered with Otterbox's Alpha Glass Privacy screen protector. The tempered glass protector has tiny fractures here and there, plus a ton of unsightly scratches, but otherwise it's doing its job; keeping those things off of the screen. As of this writing, the rest of the phone is snugly inside Apple's Product RED Silicone Case. As the device is incredibly thin and feels delicate, I've resisted the many temptations to carry it case-less. As such, the device looks like it did on this day one year ago; completely flawless and devoid of any blemishes. For a device that's been in my pocket for the better part of most of the last 365 days, I'd say that's rather impressive. The battery life has varied substantially, but that's to be expected. However, of the last 365 days, I'd say on about 360 of them did I never concern myself over whether I'd reach my charger before my phone died. I don't think I've experienced a day when my phone threatened to die before eight hours of use. Usually I experienced 15-20 hours of mixed use on one charge. Recharging every night isn't usually an issue for me so I don't need a phone that can last two days on a single charge. I don't carry a charger with me nor do I keep one in my car. At first, I did this out of arrogance. But now I do this because I'm that confident my iPhone's battery won't fail me when I need it. So far, it hasn't. iOS is iOS, and that means different things for different people. For many people, iOS represents the pinnacle of the mobile software space. It is the single-best combination of quality software, applications, content, and services running almost seamlessly together, providing the best user experience one can ask for on mobile. Detractors say iOS is Apple's way of dictating its will on users, telling them what they can and can't (really, shouldn't) do on a mobile device and that iOS holds the industry back. I think it's a bit of both. iOS is certainly unparalleled in its software offerings, both first- and third-party apps. Apple takes great care to make sure its first-party apps are feature-rich and work as they should. Further updates flesh out their capabilities and as capabilities grow, so do inter-application connections. In fact, iOS's first-party apps' capabilities with respect to inter-app communication is one of the most impressive things about iOS. For instance, if I add a location to a calendar appointment, iOS will alert me as to when I should leave my present location in order to make the next one on time. It uses Apple Maps to calculate my estimated arrival time based on distance and traffic reports. 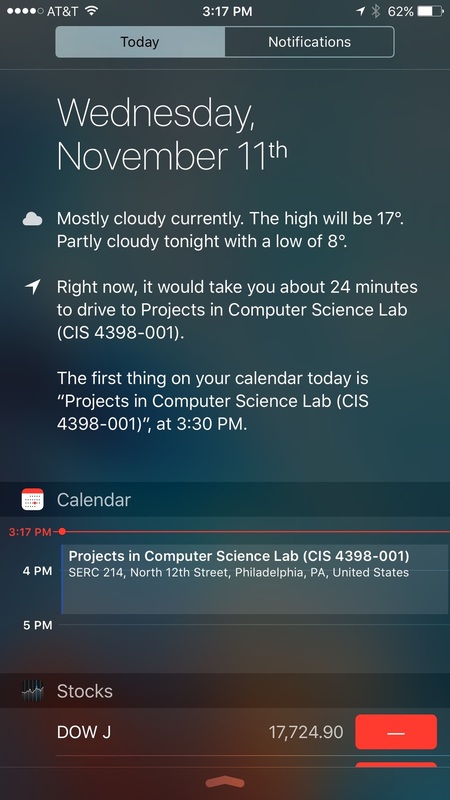 This proactive approach to notifications is rather new to mobile and it is one step in making our devices seem more intelligent. iOS 9 has taken these proactive notifications to new levels. It has the ability to learn your habits and provide to you useful information based on your routines. I visit the gym every Monday, Wednesday, and Friday, either at around 10AM or 8PM. When I sit in my car and sync my phone to it (an automatic process), iOS will tell me how long it'll take to get to my gym. On Tuesday and Thursday mornings when I get into my car to go to work, iOS will tell me how long to get there as well. It's really very incredible. Apple Music has changed the way I sync songs between devices. Apple Music takes what I love about Spotify and adds the music that I could never find on Spotify to the mix. The end result has me blissfully happy. The 500-600 songs that I have mp3 files for but have no Spotify equivalent for, can be added alongside my entire Spotify-turned-Apple Music playlist and live together in harmony. I now finally have a car that has the ability to sync with a phone through Bluetooth so I seldom listen to the radio anymore; I'm in paradise driving with my own personal playlist on full volume thanks to Apple Music. There's a lot to like about iOS. It has all the apps I didn't even know I wanted. I'm a frequent Snapchatter now and I love it. I use a bunch of financial apps like Mint, American Express, Wells Fargo, Chase, Pennies, Simple, and so on. Temple University has its own iOS app, as does Blackboard Learn for assignments. MyFitnessPal, Apple's Health and Activity apps form a neat suite of fitness apps that track my 3 miles of walking at work, my hour-long workouts, and 2-hour long tennis sessions without missing a beat. And, of course, I have my social suite of apps like Facebook, Twitter, Instagram, Tumblr, Squarespace, Hangouts, Reddit, etc. It's safe to say I'm in a happy place with regards to my mobile "needs" (read: "wants") right now. That isn't to say iOS is perfect. Those who say Apple's obsession with control is prevalent in iOS have plenty of evidence to back it up. My 6 Plus has NFC, but I can only use it for Apple Pay with Apple Pay-enabled readers. I have no file system access on my iPhone, meaning that I left behind the days of uploading a file for an assignment on-the-go or downloading an mp3 file straight to my phone a year ago. Share options, while plentiful, can be limiting too. Notifications are phenomenal, but cause the entire screen to illuminate, which can be a battery drain. I almost want to call my 6 Plus a perfect device, but I know that in this world of many smartphone manufacturers and operating systems, there really is no one "perfect device." But I do feel like my 6 Plus is the perfect phone for me. In the last year, my life has changed a lot. I'm nearing the end of college and thinking about post-Bachelors Degree life. My new job requires professionalism and is one in which communication is critical, as is being able to come up with solutions on the fly. I'm far more socially and physically active nowadays compared to myself on this day a year ago. 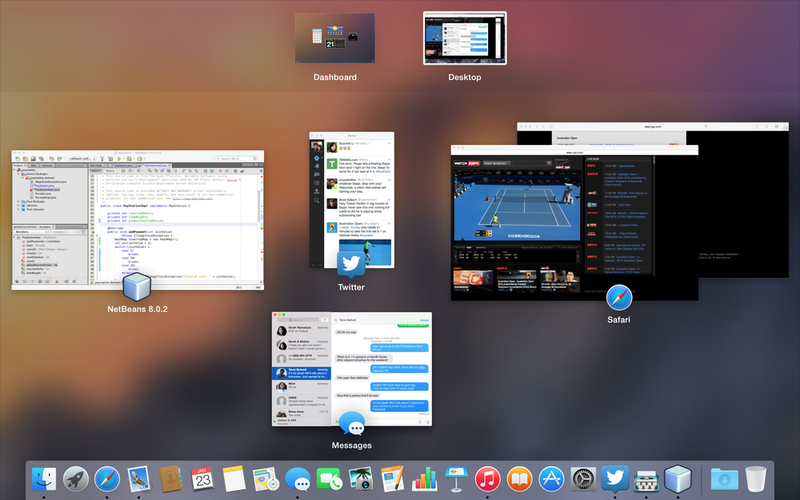 I'm a Mac owner now as well and I feel the synergy between OS X and iOS is terrific. Together, they feel like the most personal pieces of technology I've ever owned. I feel like my iPhone has better adjusted to the changes that have happened in my life. I never feel like I'm going out of my way to accommodate the things that I can and can't do on my phone, and that's the way I feel I should be. The moment I have to start adjusting my life so that I can have the phone I want, that'll be the time to look at other options. But, a year later, I'm very happy and really couldn't ask for much more. The end of 2014 and 2015 have brought with them lots of changes for me. In November I got my first iPhone and, last week, I decided to take the plunge and get my first Mac. I decided upon the mid-2014 13” MacBook Pro with Retina Display with 256GB storage. I’ve been a Windows user for years. For a period of time, I even considered myself a “Windows fan,” but, really, that was because I never really took the time to get to know OS X and the Mac environment. I loved the design and sleekness of MacBooks and tried so hard to find a Windows equivalent, but with no luck. 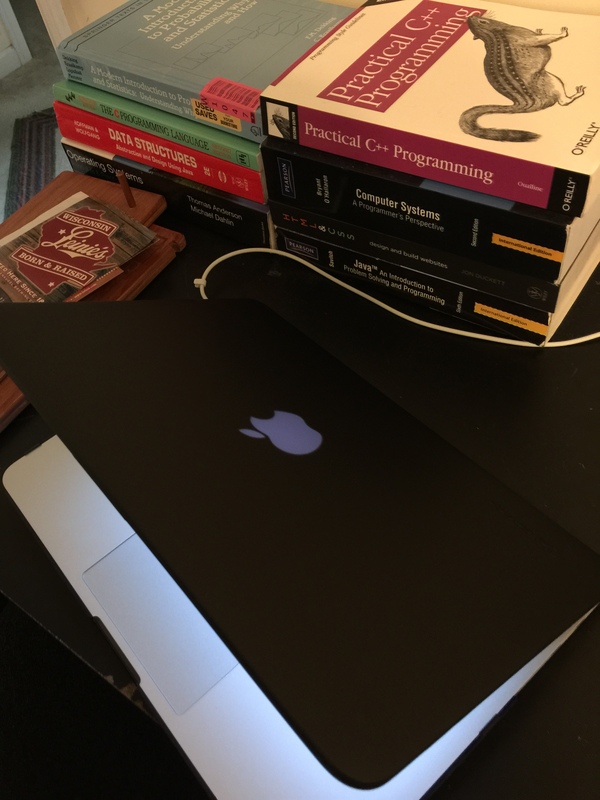 When I changed my major to computer science a couple of years ago, I decided that the advantages of having a Mac were worth the of the machine . Most of my peers had one and they were very happy with theirs. I had resolved to get a Mac long before I even considered an iPhone as my smartphone of choice. Of course, the fact that I already had an iPhone makes the MacBook all the more alluring and creates a type of synergy unique in mobile and desktop computing. So, after a week of having one, here are my initial thoughts and a round-up of my favourite apps/programs so far. General Notebook - I’m not necessarily talking about specs here, but just the way the notebook feels while I’m using it. It’s very well-built and isn’t as heavy as I thought it would be. Ventilation seems to work well as I don’t really hear any fans. The keyboard is great. The Retina Display is gorgeous. Really, there’s nothing about the Mac’s hardware that I’m missing. Multi-touch Gestures - I’m very impressed with the multi-touch gestures on Apple’s trackpad. Every gesture works well almost every time, and most are very natural. For instance, pinch-to-zoom in the web browser works just like a smartphone’s touch gesture. Pinching brings up Launchpad (the list of all installed programs) and a four-finger swipe up brings up Mission Control (all open programs). These are just a few of many but the implementation here is near-flawless. Wrist positioning - Perhaps I’m just grasping at straws here, but the only real gripe I have with this MacBook is that when I type in a natural position, the edge of the computer feels a bit sharp on my wrist. I have tiny wrists so I don’t know if that’s a factor but I can feel it when I type. Not a huge deal, but one nonetheless. OS X 10.10 Yosemite - As Temple students, we have access to both Windows machines and Macs for use around campus. When I decided to get a Mac, I maximized the amount of time I spent using one. Therefore, the transition from Windows to Mac wasn’t terribly bad for me. I’ve gotten used to the Dock and the Menu Bar at the top. Having my “X” button in the top-left vs top-right on Windows took a bit of adjusting, but that didn’t take long to get used to either. Finder is very similar to File Explorer on Windows and the two work identically. I also like just using the Terminal and working from the Command Line, from where I can remotely access my school projects through ssh. Mac App Store - Really, this is the only point of contention on the software side of things. The Mac App Store is nothing like its iOS counterpart. It’s filled with third-party substitutes for common smartphone apps and very few of the most notable developers have dedicated Mac apps. On a computer, this isn’t really a big deal, but to have a prominent store so devoid of apps is hard to look at. Safari - Just a tad embarassed to say it, but I’m actually enjoying Safari on my Mac. My experience so far has been a fast and fluid browsing experience. I haven’t heard too many great things about Google Chrome on Mac OS so I’m just a bit apprehensive to install and use it. In my opinion, Apple’s built a great browser in Safari and it does everything I need it to do quickly. Mail, Contacts, Calendar - Mail works as well as I could ask. All my emails come in around the same time as they come in on my phone and I get a notification in Notification Center. It just works. Calender and Contacts work in much the same way and everything was brought over from my phone to my computer. iTunes - I didn’t use iTunes much on my Windows laptop but I’ve started using it more now that I have a system on which it works well. It helps me manage my iPhone but, more importantly, I have access to all the music I’ve ever purchased through the service and that’s all I really need. Twitter - I didn’t even know there was a Twitter app for Mac until after I tried TweetDeck. For me, TweetDeck is a bit much. It takes up most of the screen and I don’t need all of the features TweetDeck offers, such as the activity of those I follow. Twitter is a good, minimalist app and offers integration with the Menu Bar that adds just a splash of extra convenience. Pages - I actually had Microsoft Office installed on my Mac through my family’s Office 365 subscription. But when I saw that it actually installed around 11 programs, most of which I won’t even use, I decided to uninstall them and try Apple’s native offerings (and 256GB can fill up quickly). Pages is Apple’s answer to Microsoft Word and, so far, it’s more than satisfactory for my needs. I’ve enjoyed using it and, actually, I’m beginning to prefer it to MS applications on Mac OS. Desk - Desk is a very minimalist blogging app for Mac. It’s a bit pricey at $30, but I decided to give it a try and, so far, I’m quite happy. It lets me store my drafts locally and publish to my WordPress or Tumblr sites when I’m ready. There are lots of in-text options and makes adding media to my writing very easy. So far, it’s been well-worth it. Day One - 2015 brought with it a new resolution for me; to write more. Day One is a journaling application that allows me to add photos, location, weather, etc. It has an iPhone app and the two sync seamlessly. The constant reminds on my Mac compel me to write in it almost every day. OneDrive, Dropbox, Google Drive - With 15GB on Google Drive, 15GB on Dropbox, 20GB on iCloud, and about 1TB on OneDrive, I’m covered as far as cloud storage is concerned. Each of those services has different data stored on them so I do need all of them. Xcode - Apple’s iOS and Mac OS application IDE. I haven’t had much of a chance to use it yet, but learning Swift is a goal of mine and one I intend to pursue. Connecting my iPhone also automatically opens up Developer Mode options on my iPhone, which is great because it eliminates having to use a simulator. Netbeans, Android Studio, MySQLWorkbench - Netbeans and MySQLWorkbench are specifically applications I use for school. Most programming assignments are done in Java and it’s preferred that we use Netbeans as opposed to Eclipse. MySQLWorkbench is a great tool for remote web development work (also done for school). I also have a class on Android app development this semester so Android Studio (Google’s IDE for Android development) so it will be a program used much during an long after this semester ends. iMessages are sent to my Mac as well as my iPhone. Everything syncs in real-time and the end result is seamless. Phone calls can be answered through my Mac as well and. Safari syncs between the devices and will allow me to open tabs on one device when they’re open on the other. Mail works in the same manner. I’d like to install Parallels software and run Windows 10 (eventually) in a virtualized environment. So far the only real program I’d like to have on my Mac that I can’t have conventionally is Visual Studio. A lot of people told me that a Mac is “a waste of money.” I have to disagree. For me, it’s an ideal machine. As a computer science student, I'm required to devleop software for a range of different operating systems. Macs are the only computers capable of running Windows, Linux, and Mac OS on one machine. Besides that, I’m really enjoying my Mac experience thus far. Everything works and works well. I have access to everything I did on my Windows computer and now that I have an iPhone, I have a lot of extra functionality. I’ve longed for the capability to come home, plug my phone in and stil have access to everything on my computer. My MacBook makes that a reality. I'm much more deeply entrenched within Apple's ecosystem than I had ever imagined, but this kind of synergy is very powerful. I can see why so many people opt for this duopoly. Independently, both my iPhone and MacBook are powerful devices, but I feel that, in tandem, these two together really shine. When I get home from school or work, I want to just leave my phone in one place and use my Mac for everything. Lauren: I’ve always been a huge supporter of BlackBerry, and absolutely loved their phones. My first smartphone was a BlackBerry Storm back in 2009, and I’ve had BlackBerrys ever since. The #TeamBlackBerry community was just another reason I chose to stay with BlackBerry. They helped me with issues, supported me in my various endeavors, and became some of my closest friends! As iPhones became more and more popular, I swore I would never buy one. My friends eventually all switched to iPhones, even the ones who were as dedicated to Android as I was to BlackBerry. It was hard constantly explaining why I continued to love BlackBerry, why their devices worked for me, and why I hadn’t tried an iPhone yet. Since I had never used anything different, all I knew was BlackBerry. I thought they were the best phones for me, and no other phone would even come close. David: My intrigue with BlackBerry began in 2008 when my mother brought home a BlackBerry Curve 8330. I was fascinated by a phone with the ability to load full web pages and one that had a full QWERTY keyboard. In 2009, when it came time to upgrade, I chose a Pearl Flip 8230 to be my first smartphone and my first BlackBerry. The more I used my BlackBerry, the more I loved the experience, and that experience is what brought me back in 2011 to a Torch 9810, a Z10 in early-2013, and a Z30 earlier this year. With every passing BlackBerry device that fell into my hands, the more entrenched within the #TeamBlackBerry community I became and, soon enough, I found myself surrounded by some of my now-closest friends and the only thing which brought us together were our BlackBerry devices. The allure of the iPhone and other competing operating systems normally felt distant, for a long time because BlackBerry’s experience felt better, but also because where BlackBerry lacked in a truly encompassing ecosystem, it excelled in forming a tight-knit community of users, most of whom cared about each other. With every new BlackBerry came a renewed resolve, a resolve that I would never use anything but a BlackBerry in my life. 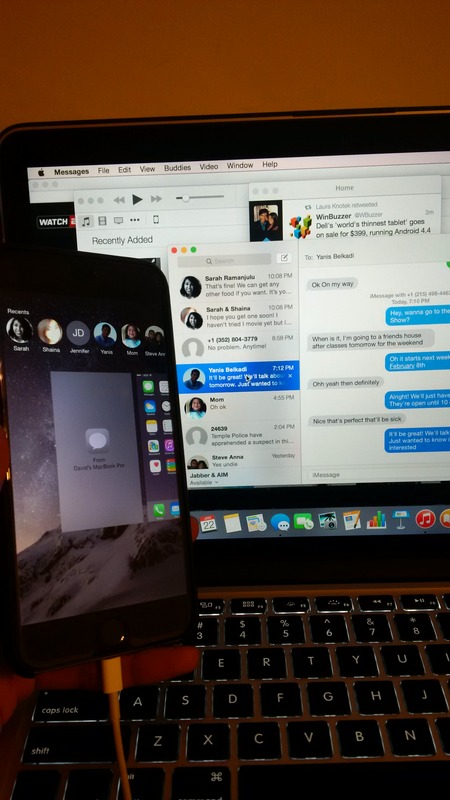 Lauren: When one of my friends switched to the iPhone 6, I decided to test out his iPhone 5. After using it for a few days, I realized that this was actually the best phone for me. I was worried that I liked this phone so much! I was always defending BlackBerry against Apple, saying how you couldn’t possibly be productive on an iPhone, and how they were for people who wanted to conform. After using the phone for a few weeks, I realized what I should have realized years ago. Just because you support a company and appreciate the products they create doesn’t mean it’s the best product for you. David: In mobile, there are only two (well, three, now) companies that develop the software and manufacture their own hardware; Apple and BlackBerry (and now Microsoft). As such, I’ve always found every iPhone since the iPhone 4 fascinating. However, the experience (combination of both hardware and software) was never enough to pull me away from BlackBerry. Still, I levied my opinion on the iPhone as if I had used one. As someone who loves technology, especially mobile technology, and a computer science undergraduate student, I recently began feeling that it was unfair of me to do this. Admittedly, it became harder to say why my BlackBerry was the best choice for me, let alone my friends, family, and anyone else who asked for my opinion on the matter. BlackBerry’s new enterprise-focused direction and target market further convinced me that it was time to explore other devices, OSs, and ecosystems. It’s difficult to say that this was fueled by a dissatisfaction for my Z30 or BlackBerry 10, but it was a feeling of alienation that pushed me to fulfill a wish 4 years in the making; the wish to give the iPhone its fair share of a chance. Lauren: Social media is my passion, and it’s the career path I plan on taking after college. Because there are so many new platforms and apps designed every day relating to social media, I need to stay up-to-date with them. This is the critical area that caused me to rethink my phone choice. BlackBerry doesn’t have the major apps that I need and want, like Instagram, Snapchat and Tumblr. Yes, there are Android apps that can be sideloaded, and there are native versions of these apps, but they just can’t compare. As much as I risk sounding like Jony Ive, everything on iPhones just works. The apps work as they should, the OS itself is lag-free and it has all of the features I want and need. Sure, there are things I miss on my BlackBerry, but things like the hub and LED come second to apps and compatibility. David: When I used to tell people why I chose a BlackBerry over other devices, I would say that I didn’t use many apps and that I didn’t need them. Well, the fact of the matter is, I never knew what it meant to have many apps to use and the world’s largest, most polished app library from which to choose. Now I have access to apps for services that I’ve used while on my BlackBerry, like Pinterest, WordPress, and all of my tennis apps. Of course, there are certain things about my BlackBerry that I miss; swiping to reach the BlackBerry Hub, the flashing LED, the typing experience, and BBM on BlackBerry. However, when it comes to the most consistent, most polished, most power-efficient operating system on the market, it’s very difficult to make a case against iOS. Everything really does just simply work as you’d like it and, for the most part, in a very elegant and efficient fashion. We can’t predict what will happen in the future, and we certainly can’t predict what phones are coming out in the upcoming months/years. When it comes to what devices we’ll be picking up in the future, it’s difficult to predict with much certainty. Right now, iOS is our operating system of choice because it works the best for us above its competitors. With that being said, the door is never fully closed on the possibility of returning to BlackBerry. We’ll be ever observant and supportive of the company that made us passionate about smartphones, hoping that it fully recovers and wins in the enterprise. Even more than that, though, we desperately hope to see BlackBerry return to the consumer market with devices that can compete for the hearts of consumers like us with a version of BlackBerry 10 that exudes the polish and elegance of iOS while, at the same time, does so in a very BlackBerry-like fashion. Whether it be through carrying one of its devices or purely through our sentiments, we’ll always support BlackBerry and our #TeamBlackBerry community. I've always admired iPhones and iOS from afar. Each iPhone release has increasingly intrigued me, but the pull of other platforms was usually too strong. Most of the time, hardware was a larger factor than software and, though I take better software than hardware, I never fairly evaluated iOS in the past to say it was truly "inferior" to what I was using. Enter the iPhone 6 Plus. When Apple announced the iPhone 6 and iPhone 6 Plus, I instantly knew which of the two devices I would choose if I were to purchase an iPhone at all. Though, the thought of me purchasing an iPhone was a far-fantasy. However, it was becoming increasingly clear to me that me calling myself a "tech enthusiast" and someone interested in mobile technology was somewhat incorrect. Yes, I love technology and I have my preferences, but I've long desired an experience away from the familiar. If I truly was using what I believed was the best, then I should have no fear in the face of using another device. If I happen to like my iPhone better than my BlackBerry, than iOS is a better fit for me. Such was the rationale behind my choice in purchasing an iPhone. I placed an order for a 64GB iPhone 6 Plus in Space Gray on Halloween and was given a delivery estimate in December. Clearly, this device was more popular than Apple had expected. I accepted that I had to wait a month and began shopping for cases and screen protectors. The benefit of having a device arrive late is that I had time to prepare. Still, I checked the stock of nearby stores on an almost daily basis, hoping that one would have my device in-stock. This past Tuesday, on a whim, I checked early in the morning (before sunrise) on my train ride into Philadelphia. The store on Walnut Street had the device in-stock. Because the store is in close proximity to my university, I decided to take the chance and seize the opportunity. I got to the store 30 minutes before it opened, grabbed a Starbucks coffee, and waited. There was one man in front of me, waiting to purchase an unlocked iPhone 6 and 6 Plus for his children for their birthdays. It was a Tuesday, but it was also Veterans' Day, and so over the next 30 minutes the line grew considerably. By 10AM, the associates had the doors open and we were allowed in and were queued up to buy our phones. The man ahead of me, unfortunately, could not purchase unlocked iPhone 6s, so he left, disappointed, of course. That left me in-front. Within 30 minutes, an excited Apple Store associate called my name, brought out my device, completed my upgrade, and I walked out of the Apple Store a happy customer with my iPhone 6 Plus in-hand. After another two hours, I was home. I canceled my Apple Store Online order and called AT&T to resolve an issue that occurred while trying to upgrade at the Apple Store. The process ended up taking about nine hours, but the kind people at AT&T were incredibly helpful in solving an issue that wasn't even a fault of their's to being with. By 10:30 that night, my iPhone was ready to be unboxed and activated. I had already played with the device in-store, so I had a good idea of how large the iPhone 6 Plus truly is. I had purchased an Apple Leather case for it and it, too, was large. The box was large. When I took the lid off and took the device out of the box, its size truly hit me; it's a big phone. The iPhone 6 Plus is not the only device on the market with a 5.5" display, but it does have large bezels. The phone is also incredibly thin and light, though heavier than most other iPhone devices. Admittedly, my BlackBerry Z30 is heavier than it, though. It's a sleek, elegant, and, truly beautiful device. It's also a slippery device (though I haven't yet dropped it yet). I powered on the device and proceeded to setting it up. The set-up process was simple enough. I already had an Apple ID so that made signing in and syncing accounts a simple task. Before long, I was left to explore the device for myself. What initially struck me was how visually stunning iOS is. It is truly a beautifully designed operating system that puts an immense amount of power into its users' hands in an easy-to-use package. Opening "Settings" showed me how deep iOS really is and the amount of ingrained integration it has with social applications. The entire OS is fast and fluid and, despite having only a 1.4 GHz dual-core processor and 1GB RAM, it flew through just about anything I put it through. Of course, that night, I spent most of my time talking to my friends, all of whom were excited to finally iMessage me and see their texts appear in blue when they talked to me. I installed a few applications, and despite the fact that not all of them were optimized for the 6 Plus's 1080p screen, they remained usable. The apps that have been optimized look great and work equally as well. That night, I hadn't even fully grasped what had happened, but I was an iPhone user. The first full day with my iPhone turned out to be an abnormally-long day with an exam that night. I decided to forego taking my Z30 with me and carried my iPhone exclusively and also decided not to carry a charger. The train ride that morning saw me use the phone continuously for an hour, talking to friends through iMessage or BBM, and installing some new applications. The great benefit of having a device running iOS is that nearly any application you want or need is available on the platform. The app is also, usually, a well-written program. Of course, Apple's stringent restrictions on what is allowed into the App Store helps to ensure that the quality of apps in the repository is higher relative to those found on competing platforms. One initial issue I had is that, by default, Twitter was sending me notifications for tweets from certain individuals. These were from people I followed, but didn't have on a "watch list" of sorts. It turns out that Twitter pre-selected 72 people that it added to a watch list for me and was sending me push notifications for each tweet. The reason it took so long for me to find the setting that toggles this particular notification is that it wasn't in iOS's universal settings menu; it was inside Twitter. Locating where particular settings are located is something which I will need to become accustomed to over time and it's something I expected to struggle with from the onset. As it was my first full day with the device, I used it more than I would normally use any device on a given day. As such, I expected battery life to be subpar and an inaccurate representation of what I'd experience on a day with more normal usage. Even on Day 1, the iPhone 6 Plus's 2910mAh battery lasted me a solid 15 hours. I plugged in that evening at about 5% battery left. When using my friends' iPhones, I thought iOS was boring and unappealing. However, the experience is different when the device is your own. iOS was described to me as the "Swiss Army Knife" of all mobile operating systems, and it's true. iOS has apps from the other three major software developers; Microsoft, Google, and BlackBerry. In fact, iOS is the only operating system in mobile that has the backing of all four major mobile players. That alone adds to its strength and presence in the mobile space. My experience so far on iOS has been a joy and the big screen and battery on the iPhone 6 Plus adds to the experience. As I had mentioned earlier, I always had an interest in trying iOS, and I had my reservations on choosing the larger of the two flagship iOS devices. But now, I feel confident that I made the correct choice, both in choosing to give iOS a try and to try it on a large device. I used to wonder why people purchased iOS devices. But I see now that iOS offers a lot of power and versatility bundled into a very simple, elegant package that just works. Are there some things I miss about my BlackBerry? Yes. Are there things I prefer on BlackBerry 10 to iOS? Yes. But, as a whole, I am thoroughly enjoying my experience on the platform and look forward to exploring it more. I look forward to writing more about my experiences on the platform and a full review soon enough.